Created in the image of God, man and woman are designed to reflect God's own nature and being. At the very heart of the Godhead-Father, Son and Spirit-we see the qualities that form the basis of our design as men and women. In the Godhead, there is perfect equality, diversity, unity and order, and it is these characteristics that shape our differences as well. Carrie Sandom, along with a rising tide of like-minded Christians, is concerned about the growth of feminism in our society, our families and our churches-and the detriment this poses to all three. She clearly presents the problem and leads readers along the path to restore God's design to its rightful place. Just as relationships in the Godhead are equal yet diverse, working together in unity and order, so are these characteristics to be reflected in the way men and women relate to one another. Scripturally grounded, Different by Design presents a biblical context for roles of men and women in marriage, the church and the workplace, with present-day implications for each. 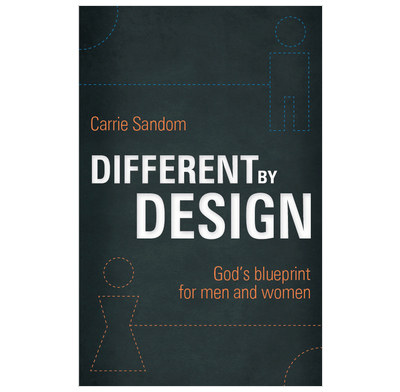 I would warmly recommend Carrie Sandom's book, Different by Design. The very title of the book is refreshingly clear, and signals the vital message Carrie seeks to outline, writing as she does in a culture which seems to want to obliterate any difference between male and female - a culture which is increasingly influential in the church as well - because we are unable, or perhaps unwilling, to see that equality does not have to mean being the same. This book helps clear away that fog. Many books on this issue can be a bit impenetrable to the "average reader"; not this one. The topic of God's design for men and women is considered through key themes of the Biblical revelation - the character of God Himself, creation, fall, redemption, consummation - and given separate application to church, home and workplace. It is therefore grounded very firmly in, and grows out of, careful but straightforward consideration of the Biblical text, rather than just dealing with what might seem to be important topics. One might not agree with all of the conclusions Carrie reaches from her treatment of various Bible passages, and at times I found myself wishing that there was room for more detailed and nuanced reflection on some Bible passages, but there is no doubting that she is seeking to let the Lord speak through His Word - sitting under it rather than (as we so often do, even without realising) sitting over it in judgment. If you want a straightforward and credible way into understanding a "complementarian" view of male/female relationships and roles, this book will certainly provide it.